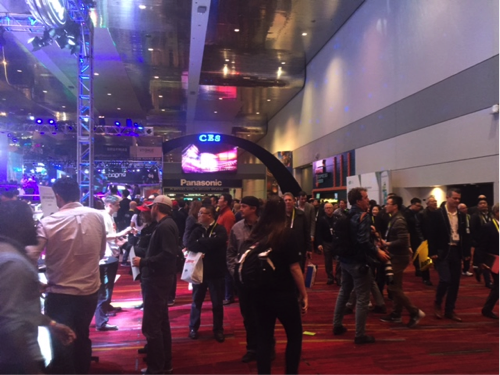 We attended CES (also known as the Computer Electronics Show in previous years) in Las Vegas, Nevada on January 6-9 and gained valuable insight into the way that the Hypnap TruRest can benefit tech consumers. The biggest take away from the show is the manner that technology is increasingly being integrated into our lives in unexpected ways. One prominent area is health and wellness. 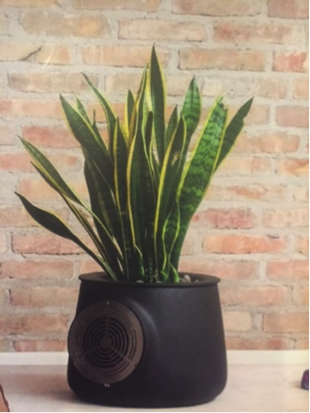 Take Laboratori Fabrici’s product Clarity – an air purifier built into the pot of a plant that uses science and technology to utilize and maximize the plant’s air purifying capabilities to eliminate toxins and purify the air in your home. Clarity’s corresponding app includes a “real-time pollution monitor, “pollution analytics” and a “temperature and humidity monitor.” It’s not available yet but it will be pretty incredible when it is! 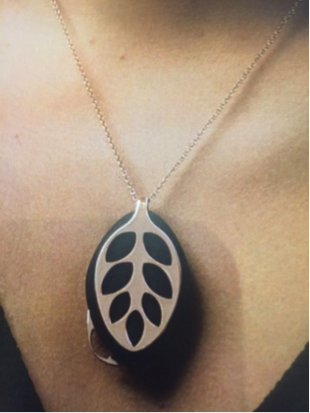 Another interesting product on display at CES was Leaf by Bellabeat. Leaf is a wearable piece of “smart jewelry” that tracks movement, counts calories, monitors quality of sleep, logs periods of light and measures and monitors breathing. It goes a step further than simply measuring data by offering advice on how to actually use and apply this data. 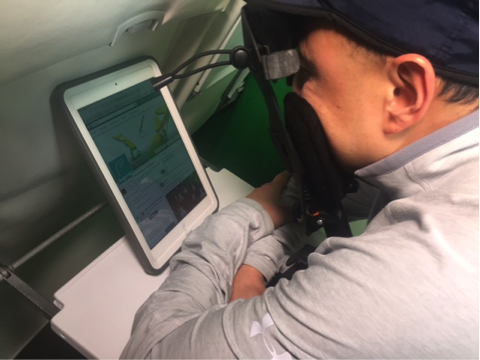 For example, it gives the user customized exercises and specific breathing exercises to control stress, and makes other recommendations based on the data collected. Hypnap was especially interested in Clarity and Leaf because of their involvement with breathing – purifying the air and tracking respiration. 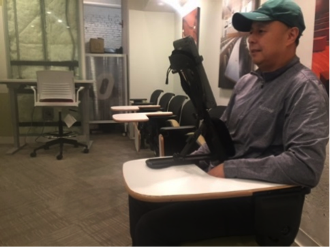 This relates to our product because the TruRest helps individuals breathe deeper and easier while using it to rest in the forward leaning position. 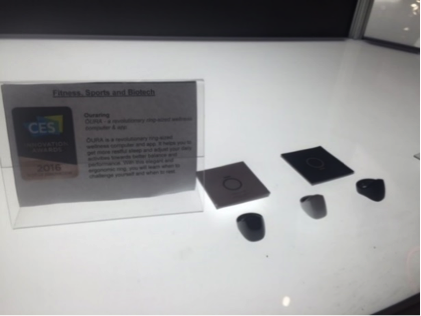 We also dropped by Oura’s booth at CES. Oura is a sleek computerized ring that provides detailed data on the user’s quality of sleep and daily activities, allowing the wearer to make lifestyle adjustments to achieve better health, balance and performance in their daily lives. It also provides customized recommendations and sends the data directly to the user’s phone. 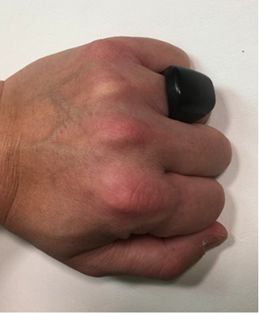 We love the detailed sleep data the Oura ring provides which naturally relates to the Hypnap TruRest as we are also trying to improve our user’s quality of rest. 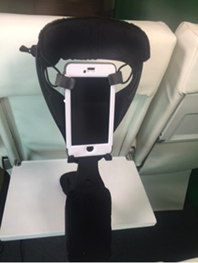 The Hypnap TruRest is a device both for rest and for use with mobile devices and dramatically increases the user’s comfort while using mobile devices. 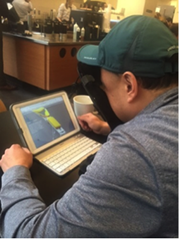 The only alternative is to hold the mobile device up with one’s arms to eye level and this is really only realistic with tablets or smaller mobile devices, not with laptops. This action puts strain on the arms, neck and shoulders. 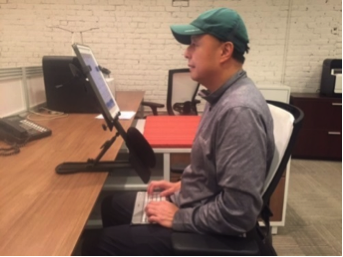 Most laptop stands do not hold a mobile device up to eye level, are not highly adjustable, do not support a range of different sizes and types of mobile devices and are bulky and thus not suited to travel. Why should you pay almost a thousand dollars for a tablet, and end up with a neck ache and arms too tired to use them? 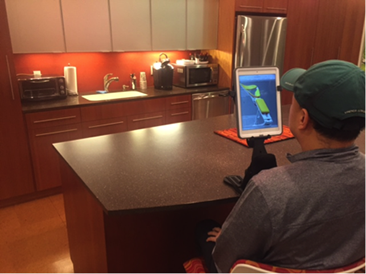 Technology and consumer goods companies do not typically consider ergonomics and how people use their products in their everyday lives. Sad, isn’t it? Luckily, ergonomics is a chief concern here at Hypnap! The ergonomically designed opening on the face plate of the TruRest allows one to breathe comfortably and see clearly, even while wearing eyeglasses. 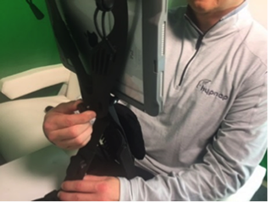 It’s easy to read or work while resting in the TruRest – just ease your body onto the chest support, place your face comfortably on the face plate and place your laptop, tablet or other mobile device on the surface below. The TruRest also functions as a mobile device stand. 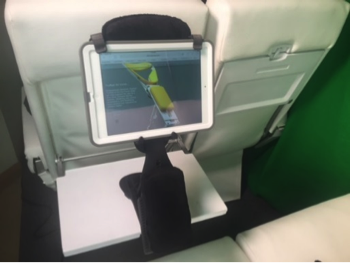 Unlike most mobile device stands the TruRest has the ability to place mobile devices at eye level, is highly adjustable, and accommodates a range of different mobile device types and sizes from iPhones to tablets the size of the Surface Pro 4. The TruRest is also lightweight (18 oz.) 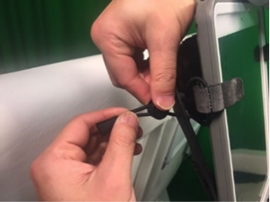 and folds up to the length of a tablet for easy carriage. 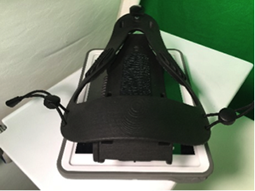 On the bottom of the face plate a shelf can be lowered where one can rest a mobile device and at the top of the face plate there are clips to secure the mobile device. 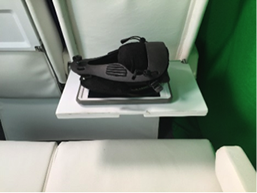 This allows one to rest leaning back in the seat and view one’s mobile device at eye level. 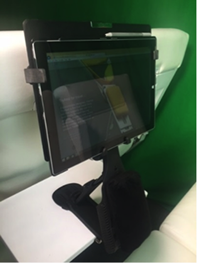 One can also adjust the height, proximity and angle of the tablet by simply customizing the adjustments on the TruRest. 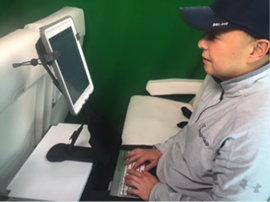 This is so much better than having to strain your eyes and neck to look down at your laptop, especially on low tables such as those found on airplanes and trains. 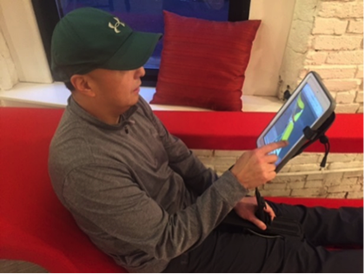 It’s also much more comfortable than holding up your tablet at eye level – arms get tired! 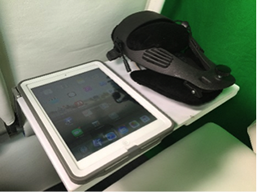 The next time you’re out and about with your tablet or other mobile device – at a café, at home, in the classroom or even at the office, use the TruRest to create more comfort. 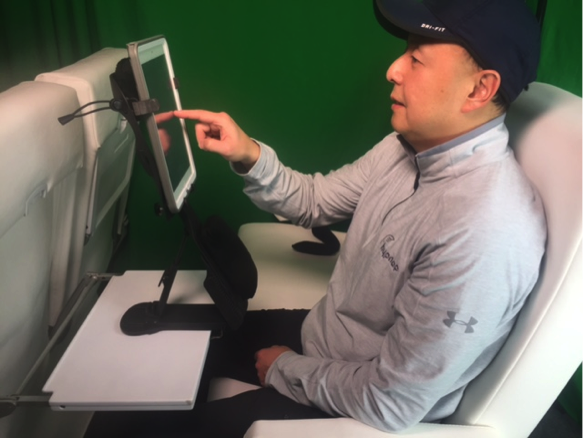 Now you can enjoy some of the same amenities that you appreciate when using your desktop, such as eye level screen viewing and a variety of adjustment features, while using the TruRest with your mobile devices. This will truly enhance your comfort and health! Much opportunity also exists for the TruRest to be compatible with tracking devices. We at Hypnap look forward to exploring the possibilities and will keep you updated!